"Florida Marlins" redirects here. For other uses, see Miami Marlins (disambiguation). The Marlins have the distinction of winning a World Series championship in both seasons they qualified for the postseason, doing so in 1997 and 2003—both times as the National League wild card team. They defeated the American League (AL) champion Cleveland Indians in the 1997 World Series, with shortstop Édgar Rentería driving in second baseman Craig Counsell for the series-clinching run in the 11th inning of the seventh and deciding game. In the 2003 season, manager Jeff Torborg was fired after 38 games. The Marlins were in last place in the NL East with a 16–22 record at the time. Torborg's successor, 72-year-old Jack McKeon, led them to the NL wild card berth in the postseason; they defeated the New York Yankees four games to two in the 2003 World Series. Wayne Huizenga, CEO of Blockbuster Entertainment Corporation, was awarded an expansion franchise in the National League (NL) for a $95 million expansion fee and the team began operations in 1993 as the Florida Marlins. The Marlins qualified for the postseason and won the World Series in 1997 and 2003, but both titles were followed by controversial periods where the team sold off all the high-priced players and rebuilt. Although they followed their 2003 World Series win with a stretch in which the team posted winning records in four of the next six seasons, along with a surprise 2006 season in which they greatly exceeded expectations and stayed in the postseason race until September, the team has had the least number of winning seasons of any Major League Baseball franchise, with just six (1997, 2003, 2004, 2005, 2008, and 2009). They are one of only two current MLB teams that have never won their division. The Marlins moved into their new ballpark, Marlins Park in 2012, which coincided with a change in the team colors/uniforms and name to the Miami Marlins. The Marlins are the only team to win a World Series in their first two winning seasons (1997 and 2003); in fact, they are the only team to even make the playoffs in their first two winning seasons. In those two seasons, they managed to make a surprise run to the World Series, both times as heavy underdogs. They are also the only team to never lose a postseason series. No-Hitters: Marlins pitchers have pitched six no-hitters in team regular-season history, five coming against teams in the NL West and one against a team from the American League (AL). Hitting for the cycle: No Marlins player has ever hit for the cycle in franchise history. See also: List of Major League Baseball retired numbers § Alternative methods of recognition. From 1993 until 2011, the Marlins had retired the number 5 in honor of Carl Barger, the first president of the Florida Marlins, who had died prior to the team's inaugural season. Barger's favorite player was Joe DiMaggio, thus the selection of number 5. With the move to the new ballpark, the team opted to honor Barger with a plaque. Logan Morrison, a Kansas City native and fan of Royals Hall-of-Famer George Brett (who wore that number with the Royals), became the first Marlins player to wear the number. After José Fernández's death as a result of a boating accident on September 25, 2016, the Miami Marlins announced plans to build a memorial at Marlins Park in his honor. However, Fernández's number 16 has yet to be officially retired. Players and managers listed in bold are depicted on their Hall of Fame plaques wearing a Marlins cap insignia. Names in bold received the award based primarily on their work as broadcasters for the Marlins. The Marlins began construction of a new, state-of-the-art stadium at the Miami Orange Bowl site on July 18, 2009. The now approved stadium was the subject of a protracted legal battle. A lawsuit by local automobile franchise mogul and former Philadelphia Eagles owner Norman Braman contested the legality of the deal with Miami-Dade County and the City of Miami. However, Miami-Dade County Judge Beth Cohen dismissed all the charges in Braman's lawsuit. The seating capacity for Marlins Park is 36,742, making it the third-smallest stadium (in capacity) in the MLB. Its first regular season game was April 4, 2012, against the St. Louis Cardinals, the ballpark became only the sixth MLB stadium to have a retractable roof, joining Rogers Centre in Toronto (1989), Chase Field in Phoenix (1998), T-Mobile Park in Seattle (1999), Minute Maid Park in Houston (2000), and Miller Park in Milwaukee (2001). As part of the new stadium agreement, the team renamed itself the Miami Marlins on November 11, 2011 and unveiled new uniforms and team logo in time for the move to the new stadium in 2012. Until a naming-rights deal is reached, the park will be known as Marlins Park. The Marlins' flagship radio station from their inception in 1993 through 2007 was WQAM 560 AM. Although the Marlins had plans to leave WQAM after 2006, they remained with WQAM for the 2007 season. On October 11, 2007, the Marlins announced an agreement with WAXY 790 AM to broadcast all games for the 2008 season. Longtime Montreal Expo and current Marlins play-by-play radio announcer Dave Van Horne won the Hall of Fame's Ford C. Frick Award for excellence in baseball broadcasting in 2010. He shares the play-by-play duties with Glenn Geffner. Games are also broadcast in Spanish on Radio Mambi 710 AM. Felo Ramírez, who calls play-by-play on that station along with Luis Quintana, won the Ford C. Frick Award from the National Baseball Hall of Fame in 2005. Marlins games are televised by Fox Sports Florida. The last "free TV" broadcast of a game was on WPXM-TV in 2005. In 1989, Back to the Future Part II had a reference to the Chicago Cubs defeating a baseball team from Miami in the 2015 World Series, ending the longest championship drought in all four of the major North American professional sports leagues. In actuality, the Cubs would end up getting swept in four games by the New York Mets in the NLCS, the Marlins failed to make the postseason, and the 2015 World Series was between the Kansas City Royals and the New York Mets, with the Royals winning in five games. Also, both the Cubs and Marlins are part of the National League, rendering a World Series matchup between the two teams impossible. The Marlins were the first team in Major League Baseball to have a dance/cheer team. Debuting in 2003, the "Marlins Mermaids" influenced other MLB teams to develop their own cheer/dance squads; this was inspired in part by similar squads from the NFL and NBA. In 2008, the Florida Marlins debuted "The Marlins Manatees", Major League Baseball's first all-male dance/energy squad, to star alongside the Mermaids. As of 2012, the Marlins have abandoned the "Mermaids" and "Manatees" for in-game entertainment instead using an "energy squad", a co-ed group of dancers. Other than their first few years as a franchise in the 1990s, the Marlins have consistently ranked as one of lowest attendance teams in the league, coming in last place (30th) several of the past 20 years. Even when Marlins Park was completed for the 2012 season, attendance was only average for the first year, dropping down to second to last by 2013. The annual financial records of the Marlins according to Forbes since 2001. ^ Frisaro, Joe (November 15, 2018). "Marlins unveil club's new logo, colors". MLB.com. MLB Advanced Media. Retrieved November 16, 2018. ^ "A new look, a new style, a new vision: introducing our colores -- the next-generation identity of the Miami Marlins". Marlins.com (Press release). MLB Advanced Media. November 15, 2018. Retrieved November 16, 2018. 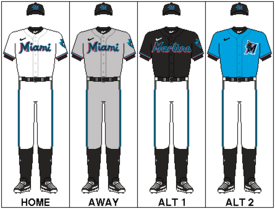 ^ "Marlins 2019 Uniforms". Marlins.com. MLB Advanced Media. November 16, 2018. Retrieved November 16, 2018. ^ Feinsand, Mark; Frisaro, Joe (September 27, 2017). "MLB OKs Marlins sale to Sherman-Jeter group". MLB.com. MLB Advanced Media. Archived from the original on September 28, 2017. Retrieved October 6, 2017. ^ Frisaro, Joe (September 27, 2011). "Sun to set on Sun Life Stadium". MLB Advanced Media. Archived from the original on July 24, 2015. Retrieved August 13, 2015. ^ Tompkins, Wayne (May 24, 2007). "Commissioners OK plan to have Marlins change name, spring-training site". Miami Today. Retrieved July 10, 2018. ^ Frisaro, Joe (November 10, 2011). "New name, but deep-rooted tradition in Miami". MLB.com. MLB Advanced Media. Archived from the original on December 4, 2014. Retrieved November 10, 2011. ^ Frisaro, Joe (November 11, 2011). "New-look Miami Marlins make colorful splash". MLB.com. MLB Advanced Media. Archived from the original on July 21, 2015. Retrieved November 11, 2011. ^ Frisaro, Joe (November 11, 2011). "Marlins break out new logo, uniforms". MLB.com. MLB Advanced Media. Archived from the original on February 15, 2016. Retrieved August 12, 2015. ^ Frisaro, Joe; Sattell, Glenn (June 3, 2017). "Heavy-hearted, hobbled Volquez nets no-no". MLB.com. MLB Advanced Media. Retrieved July 10, 2018. ^ ESPN Stats & Information (June 4, 2017). "Volquez, playing with seventh team, pitches sixth no-hitter in Marlins histor". ESPN.com. ESPN Internet Ventures, LLC. Retrieved June 4, 2017. ^ Gardner, Sam (June 1, 2017). "15 things that have never happened in a Major League Baseball game". Fox Sports. Retrieved June 4, 2017. ^ Frisaro, Joe (February 11, 2012). "Miami Marlins unretire uniform No. 5 for Morrison". MLB.com. MLB Advanced Media. Archived from the original on May 5, 2013. Retrieved July 10, 2018. ^ Frisaro, Joe (November 11, 2016). "Report: Marlins to build Fernandez memorial". MLB.com. MLB Advanced Media. Retrieved November 27, 2016. ^ "Miami Marlins Retired Numbers". MLB.com. Retrieved November 28, 2018. ^ "Van Horne wins baseball Hall of Fame's Frick Award". Fox News. December 8, 2010. ^ Oz, Mike (December 10, 2014). "Reminder: The Cubs won the 2015 World Series in 'Back to the Future 2'". Yahoo! Sports. Retrieved August 5, 2015. ^ McCorquodale, Amanda (January 13, 2012). "Marlins Mermaids Replaced By 'Energy Team'?". HuffPost. Retrieved July 10, 2018. ^ "Manager of the Year Award Winners". Baseball-Reference.com. October 30, 2008. Retrieved November 8, 2008. ^ Woolsey, Matt (April 28, 2009). "In Depth: Baseball's Most Intense Rivalries". Forbes. Retrieved July 10, 2018. Wikimedia Commons has media related to Miami Marlins.